My very good friend Max having just completed a Breman walking beam hot air engine (beautiful engine by the way) was looking for a new project. I had loaned him my Leanz plans many years ago and he had always thought about building the engine; except there was always a casting kit calling his name. Max has built many beautiful running engines over the years both IC and hot air. Complex engines like the Mery, Callahan Cam stopper, Olds gearless, etc. It doesn’t matter which engine it is; it will run like a Swiss watch when he is finished with it. The Callahan was his first model BTW. Max and I have been friends for many years and have traveled around SW Idaho together showing hit & miss engines, models, and hot air fans at the local engine shows. We also setup together for a number of years at the original GEARS show in Portland Oregon. He finally decided to tackle the Otto and at 80 years; he is thinking what have I got myself into? He was thinking if I can successfully complete the column the rest of the engine should be pretty easy; at least smaller anyway. Max is not much on internet forums, and the ins and outs of posting pictures; but he did express the desire to share his work on this engine. I jumped at the chance to help out and do the easy work for him. He gets the hard job of keeping all the complex radii, facets, raised panels, etc. straight in his head. So if there is interest this is going to be a team effort. A piece of 12L14 four inches in diameter and approximately a foot long was ordered and mounted in the lathe to get the project rolling. 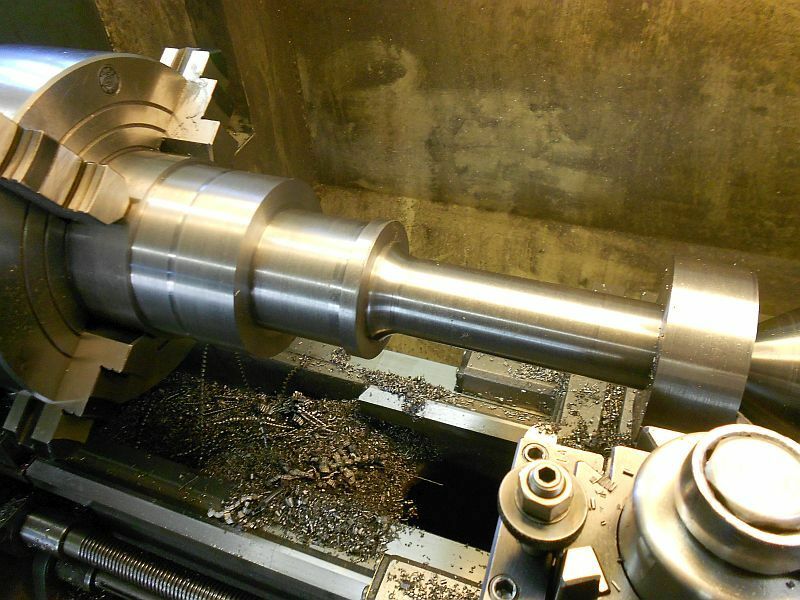 Here it has been roughed out and in this photo the steady rest has been added, then the bore drilled and bored using a ¾” solid carbide boring bar supplied by a friend. Next the column is further roughed down in the area where the flutes will be machined and the radius roughed in at the lower end. The work piece was removed and flipped around and the chucking lug removed. Then using the same boring bar the counter bore for the cylinder head is machined. 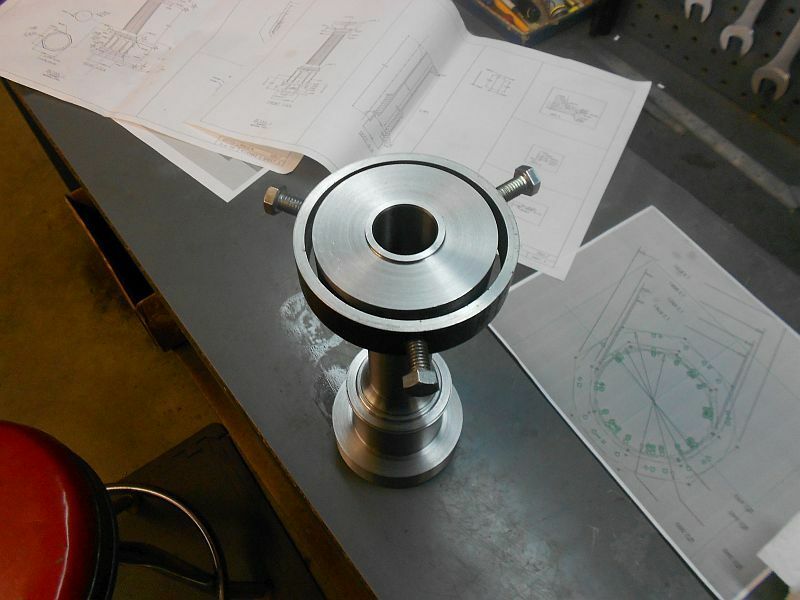 Here is a shot of the counter bore after machining. 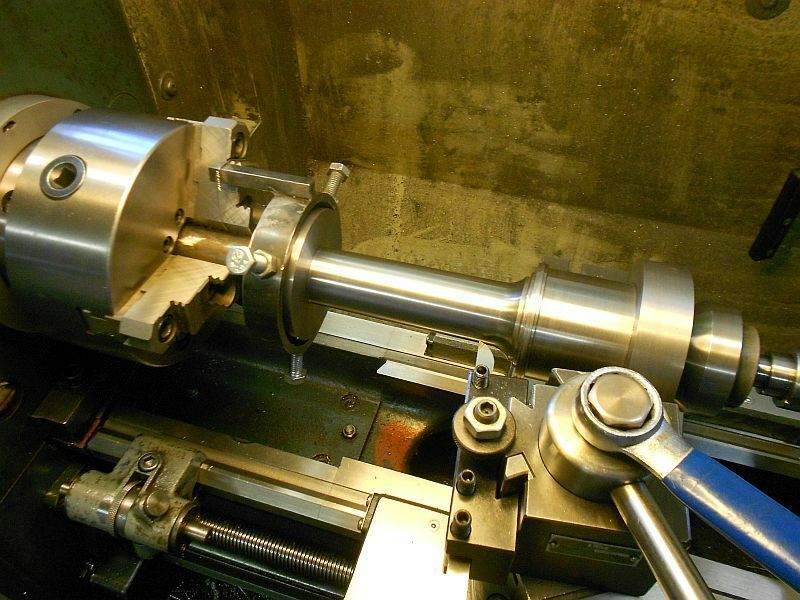 The next operation was to machine the taper of the column; this needs to be done by setting the tail stock over and running between centers. 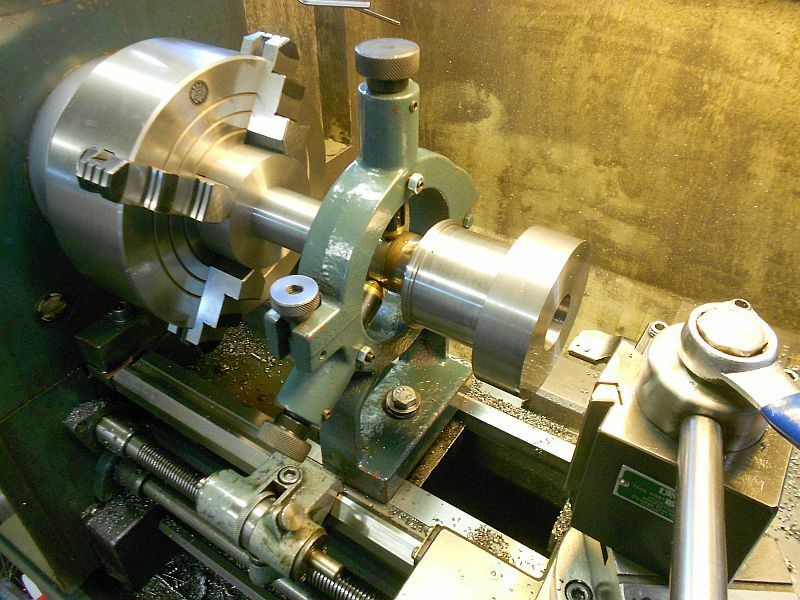 A custom cat’s head lathe dog was machined and fabricated to drive the work piece between centers. Here is the final shot from today. 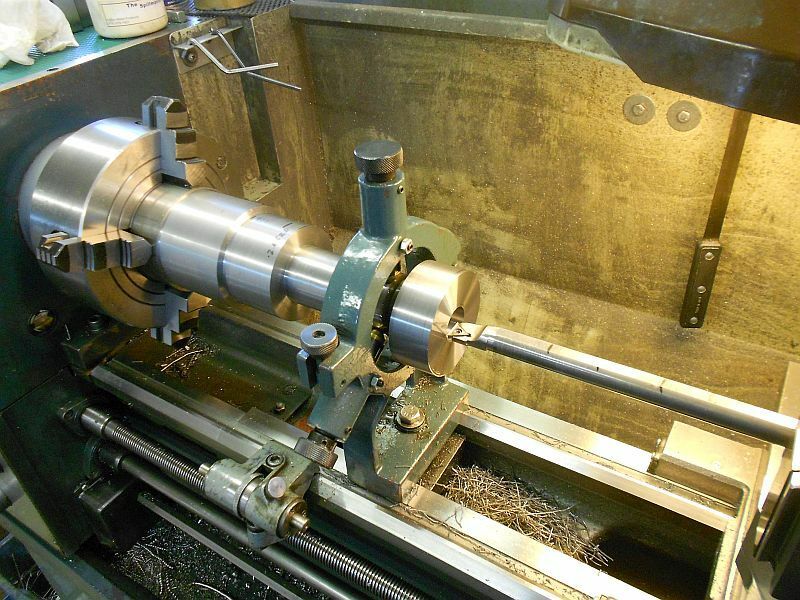 The taper has been successfully machined; notice the safety wire holding the lathe dog to the chuck jaw. What else would you expect from a retired aircraft mechanic? Also notice the bull nose center on the tailstock end. Max went into this with some reservation, but from what I’m seeing so far the column is going to be a success. I've learned a couple of things already! Hi Dave, Max, very interesting to see that column taking shap out of this bar stock. I have printed the plans some weeks ago too and sometimes I am looking at it. And Jo being Jo now wants it longer! Excellent pics and comments. The work is awesome. Many thanks for starting this thread Dave. I am looking forward to following Max's work, thanks to your help. Thanks for all the great support everyone; this is going to be fun! Don; the bore is actually a little over 8 inches; when the part was turned around and the chucking lug removed, counter bore added the lower end of the bore was exposed. Max said that he used snap gages to check the size; but found out when he was able to measure the lower end of the bore there was some taper. He blames the lathe for this. Definitely pushing the limits of that boring bar; but it appears that he got away with it. 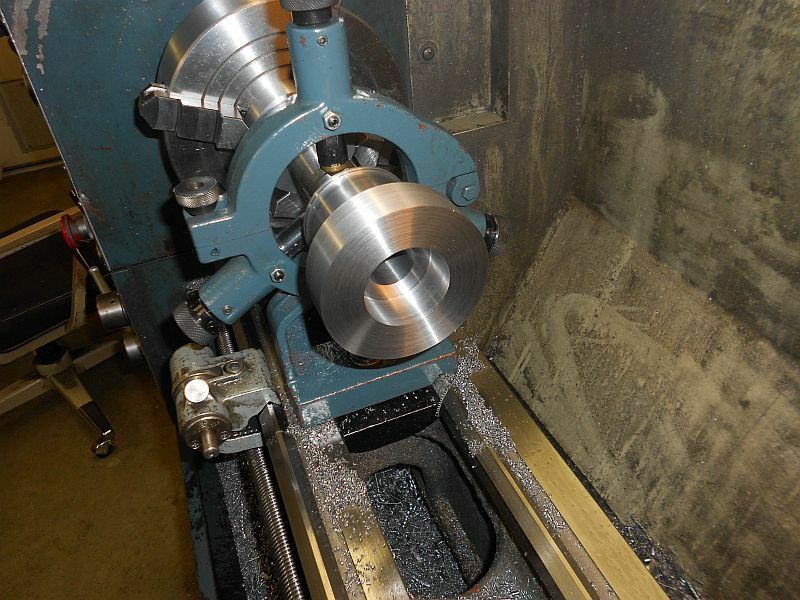 The bore will get honed or lapped and the taper will be taken care of then. Max is a registered member here "112235" hopefully we can get him to chime in a little? Pulled up a chair and will be eagerly following along. Thanks for doing this thread. That's an impressive part! For a newby like myself would you mind giving a little thumbnail sketch as to what this engine is all about? Maybe a link to more info. Hi Jim, maybe this link will be helpfull. That's great thanks. I didn't know quite what I was looking for. I did a YouTube search and was able to find some videos. What a fascinating engine! Well he definitely knows his way around the shed; does he like IPAs ?